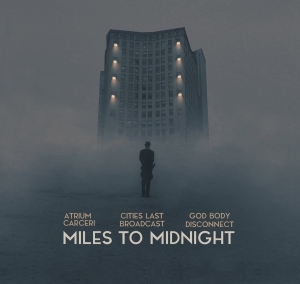 Miles To Midnight indeed is like a film noir, a dark movie in the vein of Mulholland Drive and the likes. You know, those oppressive, weird, breath-taking cinematic concepts à la Lynch. As from the opening song that’s an evidence. Quite immediately it does remind me of Cities Last Broadcast’s spooky walls of haunting story-telling especially. Pär creates thick layers of asphyxiating claustrophobia, simple and subtle, yet pointing. No doubt that some of the mystic and mesmerizing elements from his other project Hymnambulae do come to mind as well. The feeling of discomfort gets darkened intensively by the obscure, abyssal drones courtesy of Atrium Carceri. It does veil the whole in a lightless mist, professionally able to translate the story’s protagonist into disorientation. You feel it, you taste it, you just get into the detective’s confused presence. God Body Disconnect strengthen the mysterious, horrific character of this sonic story with its doomed synth layers. There’s also that Dark Jazz aspect, created by, for example, his jazzy drum patterns, reminding me, once again, of Angelo Badalamenti. Miles To Midnight gets released, of course, via Cryo Chamber, one of the most prominent labels within the contemporary Ambient / Drone scene, and run by Simon. The latter did master the album (like about each single release on his label), and once again he took care of the artwork too (this one fitting perfectly to the album’s concept, of course). And oh yes, soon I will write and upload a review for Ur Djupan Dal, another collaborative creation that involves Atrium Carceri, this time with Herbst9. Stay tuned!